By AJAZEERA 30 September 2012 Kenyan and Somali troops are preparing to move into Kismayo following the withdrawal of rebel fighters from the southern port city, Hussein Arab Isse, Somalia's deputy prime minister, has told Al Jazeera. Isse, who is also in charge of the country's defence ministry, said on Sunday that troops would enter the key commercial city later in the day. Joint forces launched a series of assaults to take the city on Friday, forcing al-Shabab rebels to withdraw from the port town - their last stronghold in Somalia. The Kenyan and African Union troops, who surround the city, have been waiting for peace negotiations to conclude with tribal elders there. "We truly pacified the city without any problems," Isse said. Residents in Kismayo said they woke to find police and government headquarters abandoned by al-Shabab, sparking a looting spree of the government and police headquarters. "We are entering Kismayo with caution and working very closely with people inside the city, however there are special forces inside Kismayo to ensure al-Shabab fighters are not causing harm," the Somali deputy prime minister said. Al-Shabab's withdrawal came about 24 hours after Kenyan forces made a beach landing and as inland troops from Somalia and Kenya moved toward the commercial city from the west. Al-Shabab found little popular support in Kismayo because of the conservative brand of Islam it tried to impose on residents, carrying out public executions, whippings and amputations as punishments, and enforced a conservative dress code. 'Military tactic' Rebel fighters on the ground confirmed the withdrawal on Saturday. "We got orders from our superiors to withdraw from the city... this is part of broader military tactic we have set for the enemy," said Sheikh Mohamed Abu-Fatma, a commander for the group, told the AFP news agency by telephone. "According to eyewitnesses, there are no armed forces in the city, just civilians. There are adminstrative buildings being looted, and the city is in a state of chaos," reported Al Jazeera's Abdirahman Sahal from Kismayo on Saturday. "The town is not under anyone's control now," Mohamed Hassan, a resident, said. "People feel some relief now. We hope no more fighting will take place." "Looting and chaos is going on here. Thugs are taking advantage of the vacuum,'' Maryan Hussein, another resident, said. "The abandoned houses are being ransacked and the streets are occupied by people carrying belongings." The Kenya Defence Force said that it was treating the announcement of the al-Shabab withdrawal with caution, and that they would be moving into the areas that were under rebel control at the time of the initial assault in the early hours of Friday. "As soon as we consolidate, we will move to take the rest of the city," Colonel Cyrus Oguna, a Kenyan military spokesperson, said. Strategic location In the past four weeks, fearing an assault by the Kenyans, an estimated 12,000 people have fled the city, whose total population is estimated at between 160,000 and 190,000. "This is a major blow to them and we think it's positive for the region and for Somalia," said Musalia Mudavadi, a deputy Somali prime minister. Speaking on the sidelines of the UN General Assembly in New York, Mudavadi called the entry of Kenyan forces into the Somali port "a significant victory". The loss of Kismayo a day after it was attacked by Kenyan and Somali soldiers backed by air strikes will deal a major blow to the al-Qaeda-linked rebels, weakening morale and depriving them of revenue from taxing local businesses and shipping. 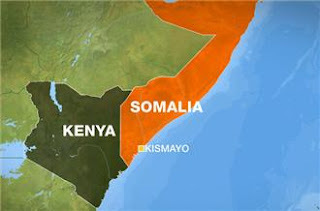 Al Jazeera's Mohammed Adow described Kismayo as a very important and strategic town for the group. Kismayo, "is the backbone of the funding of al-Shabab"; it is also the location from which the group bring in their arms and supplies, he said. Losing city, said Adow, would be "a huge setback for" the group and would leave them with the Somali capital as the only place that can provide al-Shabab with a hideout where they will also have access to "soft targets". Ideological war Abu Omar, the al-Shabab military commander, said that the group's fight in Kismayo and elsewhere was not about territory, but ideology: Al Jazeera's Peter Greste explains the strategic significance of Kismayo "[Territorial control] is not what we are basing our battles on. It's not based on territory lost or gained. This is an ideological warfare, we are fighting for an ideology that transcends geographical boundaries ... we will continue to fight this war until we establish the laws of Allah on Earth," he told Al Jazeera. Along with forces from Uganda, Burundi and Djibouti, Kenyan troops have been battling the group, which is said to have links to al-Qaeda, as part of an African Union peacekeeping force mandated with wiping out the figthers from their strongholds. Kenya sent its troops into Somalia last October after the fighters were blamed for a series of raids on Kenyan soil targeting its security forces as well as Western tourists. Somalia has made progress in the past year in battling the group, who have wanted to impose their interpretation of Sharia law across the country since taking control of large swathes of south-central Somalia from 2007. In places where al-Shabab have abandoned fixed positions in the past, most notably in the capital Mogadishu, they have switched to guerrilla tactics and remained a threat.